Following consultation with the client and preparation of the design, planting is carefully considered, based on a number of factors, including client taste, garden location, house style and maintenance requirements. At this point, site specific conditions are also considered, such as soil type, garden orientation, light levels, wind exposure, etc. 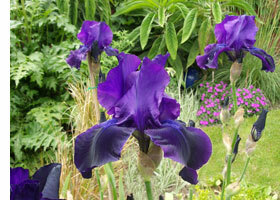 Plants are then selected to provide maximum impact and seasonal interest. 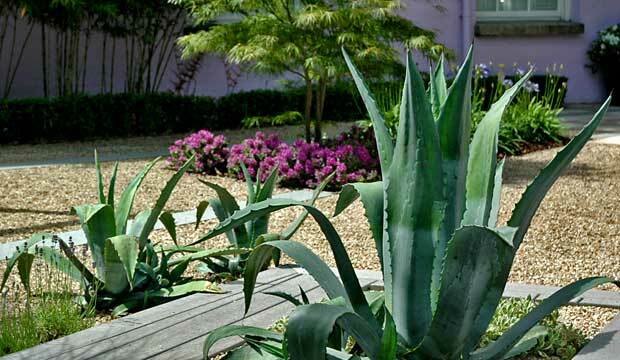 Mediterranean planting to gravel garden and deck insert. A limited palette of plant varieties and colour used in larger numbers around the garden produce a calm relaxed effect, while repeat planting links the various areas and draws the eye around the garden. 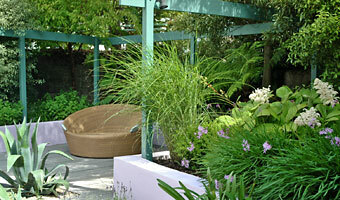 Use of dramatic planting works well with formal structures in the garden. A combination of architectural plant form and bold flower colour. Plant form, foliage texture and shape, coupled with their subtle colour variations can be every bit as important as the colour and drama provided by flowers. A variety of plants selected for their form, foliage texture and colour.